Do you want your puppy to grow into the kind of dog that you can take anywhere, and do anything with? The kind of dog that sits outside the coffee shop with you, strolls along your side at the farmer's market, plays nicely with your friends dogs, and that you don't have to hide in the basement when your kids have friends over? We can help! At ballwalkpark, we know puppies, we love puppies, and we love to help raise puppies into the best adult dogs. How do we do it? We believe in tons of socialization, plenty of exercise, and just the right balance of discipline and love and affection. Let us help you design a program that caters to your schedule's needs as well as your puppy's needs with our puppy packages, puppy socialization field trips and puppy play dates. Our classic puppy package includes two 20-30 minute visits a day, spaced 2-3 hours a part, depending on your schedule. During these visits we work on reinforcing potty training, clean up any mess, play time, basic commands, intro to leash walking and socialization. In the early weeks, we often stay in the yard since a puppy's immunity is still developing. As they grow, we introduce puppy socialization field trips and puppy play dates. The base price for our daily Puppy Package is $40 per day. Must be enrolled in puppy class by 10wks of age - ask us for referrals! Puppy play is crucial to help your puppy establish boundaries of social interactions, learn self control, and appropriate play behavior. We will set up play dates with other puppies we are caring for, and gradually work up to introducing your pup to older ballwalkpark dogs that we have come to call our "puppy trainers". All dogs are up to date on vaccinations and are excellent with puppies. This is a great way to transition your pup into joining the dog park trips once they are of age. Puppy play dates also make for a very tired puppy, which is always nice! In combination with the puppy package visits, we will do one long visit (still meeting your schedule needs, of course) and take your puppy on field trips to get exposed to things they may not be getting in their own neighborhood, based on your feedback and observations. For example, one week we may go sit outside of a coffee shop to get used to being calm when lots of people are around. 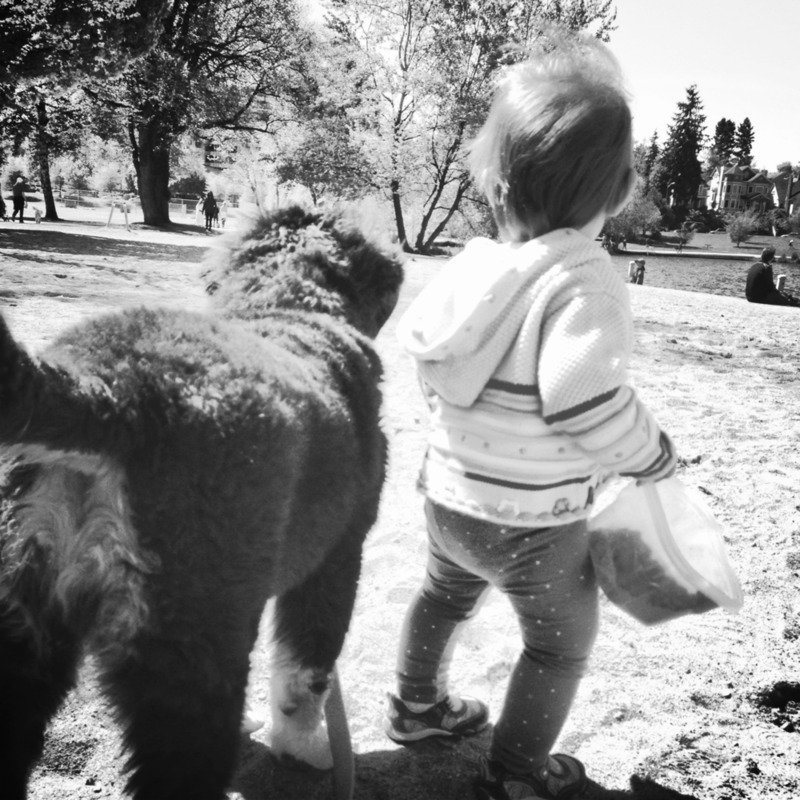 The next week we might go to Greenlake to get used to bikes, skateboards, strollers, etc. We try to check off as many items as we can on the ASPCA's Exposure Checklist for Socializing Your Puppy.